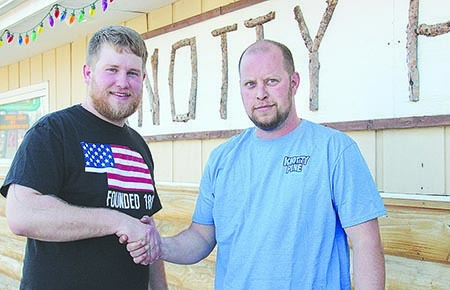 Drew Niewohner, left, congratulates Dustin Guthard as the new proprietor of Knotty Pine in Petersburg. Dustin Guthard of Petersburg took over Monday, April 29, as the new proprietor of Knotty Pine in Petersburg. Dustin grew up in Newman Grove, and he is a 2001 graduate of Newman Grove High School. He and his wife, Krissy, and their three children moved to Petersburg in 2009. Krissy grew up in Petersburg and works with her stepfather, Larry Temme, at Rae Valley Market. Dustin’s background includes auto sales and the construction trades. He headed a crew that built the Preferred Sands processing plant at Genoa. For the past 10 years, Dustin has operated hay grinding equipment for Zoucha Hay Grinding, Albion. Read the complete story in the May 2 Albion News & Petersburg Press, Print and E-Editions.